I remember how back in Year 2006, I was in Sec 2 & Virina went crazy over elections & got me involved someway or another. This is probably the few times (not many to begin with) I'm actually interested in Politics & even bothered to blog about it (at my own risk, yes I know!) Freedom of Speech in Singapore, right? So what got me so interested? THE PEOPLE. To be specific, Nicole Seah & of course, there comes Tin Pei Ling after. So anyways, the question is: Who impressed me more? So now you understand why Nicole Seah is a better choice? But of course, I wouldn't compare it this way. Because they are running in a GRC, Group. 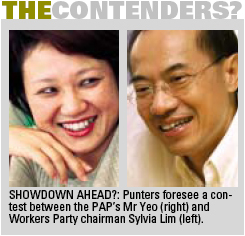 If the elections were based on INDIVIDUAL, I'll place all my bets on Nicole Seah & make a fortune out of it. Say Real. But it's grouped, so it's really hard to say. Nicole VS Mr Goh. WHOA. Nevertheless, not everyone is perfect. Definitely not me. But for them, I think both TPL and NS should go for speech lessons. TPL sounds like some online tutorial voice (too much of a storytelling memory work), & NS sounds too aggressive coupled with this unfriendly monotone hard 'shouting' voice. Maybe it's just me, but that's what I hear IF CONSIDERING I don't see their face from the videos watched. I have no idea how to reply to this. 1. I live at Siglap. Why is my region under Joo Chiat? I have no idea. Allocation plan CUI. 2. I never even see my MP before. Not before, Not EVEN during, Not after. I open my letterbox & saw the flyer from Workers Party. 3. I didn't hear both parties' rallies so I don't know what each side promise my region. But honestly, the last 5years, if PAP did promise to do something, I don't see anything being done cause like no change? I'm not even affected. So tell me, what did you guys do for us? I'm gonna run for General Elections in 5years time. Singapore, Brace Up & Embrace Me! Don't bother digging up this post yo!